I know a lot of you are going through midterms right about now, and so am I! I totally understand the struggle of having hours of homework and studying to do. 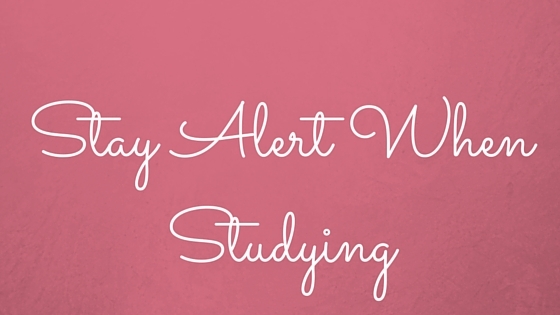 Today, I'm sharing some of my tips for staying alert when studying! These tips probably won't work for you if you're studying in public, but if you study in your room like I do, then this will probably help a little! I find that I feel the most sluggish when I'm sitting down for hours doing homework. I like to take breaks in my homework and get up and move. For me, that's usually doing some handstands or doing some ballet warm ups just to get the blood moving. You can really do anything, though, you can walk around your room, do some jumping jacks, push ups, the options are endless! You just want to get your blood pumping again, so you can refocus on your next assignment. Sometimes you have projects that take forever, or you're studying for a test and you know you're going to be doing that for hours. I like to set a timer for 45 minutes and then take a 5-10 minute break once the timer goes off. During the break I can pee, get food/drinks, move a little, and then refocus once my little break is over. This is the best way for me to get myself to do homework for a class that I'm not super into! I'll tell myself that I can have a piece of candy or that I can watch a tv show once I finish whatever it is that I need to do. That provides a little incentive that I need to push through and finish what I need to get done! This is going to totally depend on the type of person you are. For me, I like to listen to classical music when I'm reading because it helps me to stay present and remember what I'm reading. Personally, I am a huge Vivaldi fan so that's been my go to lately, but I totally get that music can be distracting for some people. Sometimes you're rightfully tired. It's not because you're trying to do a lot and are bored, but it's because you're physically exhausted. Your brain can't work as efficiently when you're sleep deprived, so if this is the case, it might be better to sleep for a little bit, and study once you're well rested.